Republicans maintained control of the U.S. Senate while Democrats regained the majority in the U.S. House of Representatives — flipping three Virginia seats — for the first time in eight years in Tuesday’s midterm elections. The shift in Congress sets up a divided government until at least the 2020 elections. It will give Democrats a new platform on which to challenge President Donald Trump on a number of hot-button issues. These include the investigation into Russian interference in the 2016 election and whether the president was involved in it. 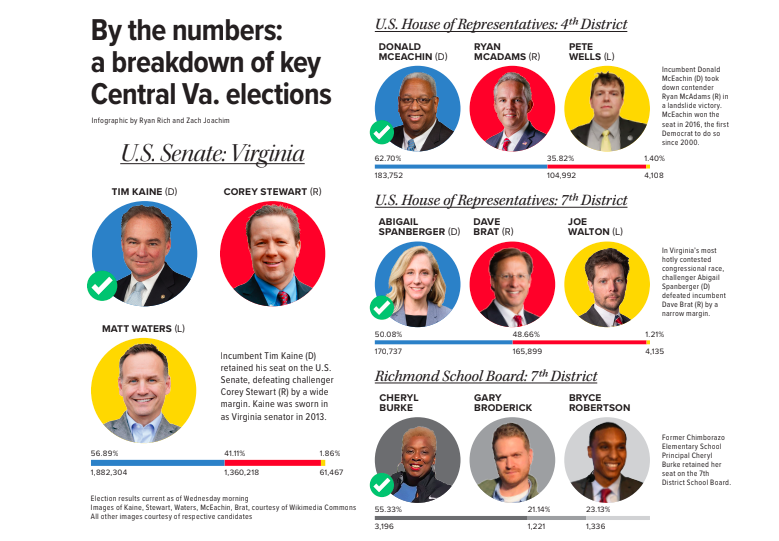 Sen. Tim Kaine (D-Va.), Hillary Clinton’s running-mate in 2016, cruised to re-election despite a challenge from Prince William County Board of Supervisors chairman, Republican candidate Corey Stewart. Stewart, who chaired the Trump 2016 campaign in Virginia, allied himself politically with the president during his candidacy. 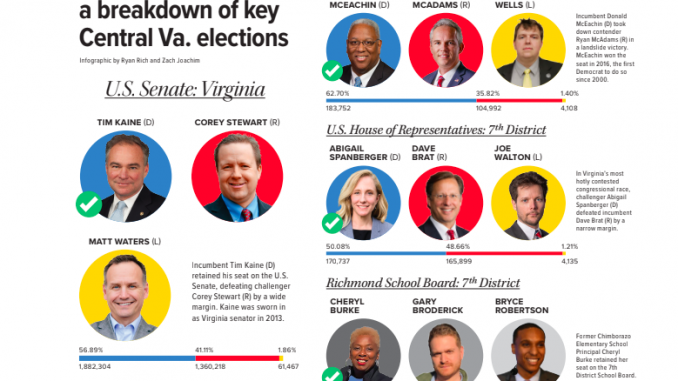 Virginia will send two Democrats to the Senate for the fifth election in a row. In one of Virginia’s most hotly contested congressional races, Democrat Abigail Spanberger unseated GOP Rep. Dave Brat by a razor-thin margin of less than 5,000 votes to become the first Democrat to win the 7th District in 50 years. Brat made a name for himself in 2014 when he unseated then-House Majority Leader Eric Cantor. Brat, who did not appear at his Short Pump watch party, is yet to concede the election as of early Wednesday morning. In northern Virginia, Rep. Barbara Comstock (R-Va. 10th District) lost to Democratic challenger Jennifer Wexton by more than 12 percent of the vote. 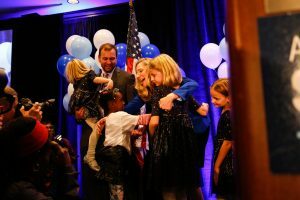 Comstock’s effort to defend a district that voted for Hillary Clinton by a wide margin in 2016 was largely derailed by Wexton’s 18-point margin of victory in the suburbs of Loudoun County. In Virginia’s 2nd District, Democrat Elaine Luria edged past GOP Rep. Scott Taylor, whose former district encompassed Virginia Beach. In her victory speech, Luria said her win was a victory for those who reject partisanship in Washington. “For a while now, we’ve had leaders in Washington who don’t share the values of coastal Virginia, values of decency, community and service the country over all else,” Luria said, according to The Virginian-Pilot. A victory by Republican Denver Riggleman in the 5th District — which encompasses Charlottesville as well as some central and southern parts of the state — means the area will remain red after Rep. Tom Garrett chose to not seek re-election.